In the mid 1950s, Robert Rauschenberg sought a greater connection between art and life, famously declaring his ambition was to ‘act in that gap between the two’. He used collage and assemblage to incorporate everyday materials into his work, an approach that subsequently influenced many artists around the world. The two works on display, both titled Dylaby , were part of an installation Rauschenberg made for the exhibition Dylaby: dynamic labyrinth in 1962. 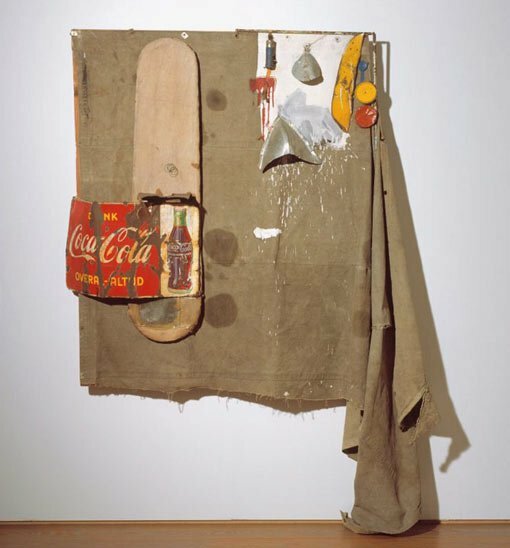 They are both ‘combines’, the term Rauschenberg coined to describe his works that combined elements of both painting and sculpture, and found material such as the Coca-Cola sign and ironing board you see here. Create a body of work titled The future is now . Think about what this concept means and how it is relevant in today’s world. Compare your work to Rauschenberg’s art practice. What is similar or different? What has Rauschenberg done to 'act in the gap between art and life’? Do you think he has successfully fulfilled his aim? Imagine you are an art critic in the 1960s and are seeing these works titled Dylaby for the first time. Write a critique, including the works’ relevance in art history to that point in time. Pop art seemed to arrive like a cartoon explosion in the early 1960s but its origins lay in the previous decade. In the 1950s artists began responding to the dramatic social and cultural changes that followed WWII. One of the names for this new art was ‘neo-dada’, in homage to the disruptive dada art movement that had followed WWI. In London, younger members of the Institute of Contemporary Arts formed the Independent Group which produced a series of lectures, essays and exhibitions exploring popular culture. American consumer goods and mass entertainment seemed glamorous and desirable in austere postwar Britain and artists such as Eduardo Paolozzi and Richard Hamilton created collages from advertisements and images found in American magazines. In America itself, the dominant abstract expressionist movement promoted an intensely personal and enclosed art. Some younger artists desired a greater connection between art and everyday life, and reacted against what they saw as the self-referential nature of abstraction. 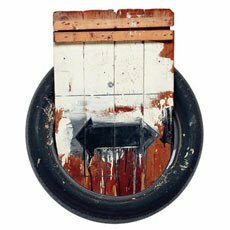 Robert Rauschenberg sought this connection by incorporating found objects into his work, while Jasper Johns painted familiar and banal subjects such as numbers and letters. In Australia, the Sydney-based artists known as the Annandale Imitation Realists combined collaged objects and images with paint and text in a neoprimitive ‘funk and junk’ style that was an exhilarating local pop art precursor.